One of Redwood City's best restaurants, we are an award winning, seasonally-inspired, bar and restaurant highlighting our favorite method of cooking: the grill. The Grill House bar's motto is "Drink Local". Co-owner and general manager Will Hayes selects the best of what the Bay Area has to offer in beer, wine and liquor, The bar features a rotating craft beer menu with 16 local-only draft beers, a wine menu sourced from all around northern California and a spirits list that highlights the growing movement towards locally-sourced ingredients and hand-crafted artisan cocktails. Subscribe to hear about menu updates, upcoming promotions, discounts and giveaways. To request a reservation, please click here and provide your desired date and time. Thank you for your request. We will confirm your reservation within 24 hours. At The Grill House, we’re grilling everything with a local flair. All of our chicken comes from Petaluma, our sausage from San Leandro and our burgers are ground daily. Our bar also features a number of local selections and we are a recipient of a ‘San Mateo County As Fresh as it Gets’ award for sourcing local. We are family friendly - Check out our full kids menu below. Located less than two miles from both downtown San Carlos and the Belmont train station, we are known as one of Redwood City's best craft beer bars, featuring a rotating tap selection comprised of limited, local craft draft beers. With 16 all-local draft taps available, our beer list is constantly changing, so make sure to check back to see what new local, craft beer we just tapped. And don't forget about our Happy Hour, available Monday through Friday from 3pm to 6pm. We feature a carefully selected wine list featuring only Northern California wines and a full bar including a number of local craft spirits. We also showcase a selection of 18 whiskeys, including 4 produced locally. Looking for more local spirits? Check out our 18 other local spirits, including tequila, rum, gin and vodka. Join us for happy hour and enjoy $2 off all appetizers, all 16 of our local craft draft beers, every glass of our locally-sourced wine and our GH custom-crafted cocktails. *Happy Hour is available throughout the restaurant. Every Monday night, enjoy all night happy hour from 3pm to close. The Grill House is perfect for groups. 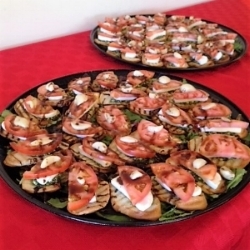 We have hosted parties from 20 to 90 people and are ideal for business lunches, dinners and happy hours. With our full bar, we are great for group celebrations and can host events such as a cocktail hour with light appetizers, a dinner buffet or a full four-course meal. We can even host private events with a DJ or live music. Planning a party? Give us a call or send us an email and we will be happy to provide you with a free quote. 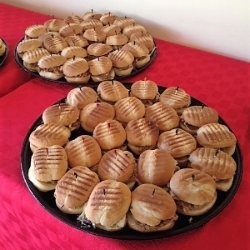 CLICK HERE TO SEE OUR SAMPLE CATERING MENU! The Grill House features a weekend brunch every Saturday and Sunday until 2pm. Join us on Sundays for The NFL Sunday Ticket, featuring every NFL game. We have 9 HDTVs scattered throughout the restaurant to guarantee a good seat for every game. We open every Sunday at 9:45 am during the NFL season.